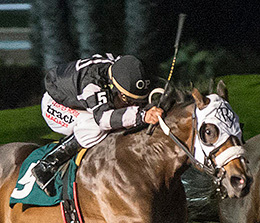 Grade 2 Kindergarten Futurity finalist Pack Light will headline an allowance race on Saturday night at Los Alamitos Race Course. LOS ALAMITOS, CA—NOVEMBER 2, 2018—Pack Light and Striver, a pair of finalists to the Grade 2 Robert Adair Kindergarten Futurity, will headline their respective allowance events on Saturday night at Los Alamitos. The nine-race program will feature a total four allowance races, which include an 870-yard test led by Genaro Vallejo-trained Ultra Fame, a two-time winner at Golden Gate last year, and Dennis January's Jen's Journey, a winner of his last two starts. The card also features a 100-yard allowance led by graded stakes running mares Apollitical Dasher and Zendaya. . The main events are the two allowances for juveniles. Reliance Ranches' Pack Light will headline the eighth at 330 yards. The One Famous Eagle filly won her first two starts and was a 3/4 length Kindergarten trial winner over eventual Grade 2 PCQHRA Breeders Futurity winner Cole Man 47. But in the Kindergarten final, Pack Light had a troubled trip and finished eighth. .
She was then favored to win her Ed Burke Million Futurity trial, but was slow at the start and finished behind eventual Ed Burke Million winner Wave Her Down. This will be Pack Light's first start since that trial race. The unbeaten My Favorite Legacy, allowance winner Deceiver and futurity trial winner Shes Got Fire are among the other 2-year-olds in this race. Juan Carlos Chavez's three-time futurity finalist Striver is the big name in the 330-yard ninth race. The Kindergarten runner-up is making her first start since running sixth to Golden State Million finalist Powerful Favorite in the Governor's Cup Futurity on July 28.